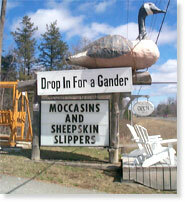 Watch For "THE BIG GOOSE" On The Highway and Be Sure To "DROP IN FOR A GANDER"
The Little Store With The Big Inventory! We specialize in sheepskin products such as slippers, mitts, hats and gloves. A Large Selection of Quality Canadian Made Leather Coats and Columbia Cottage Casual Clothing. T-shirts and Sweat Shirts available, as well as purses, wallets, mohair socks, fleece blankets and jackets.